COOK -Carte des Isles Sandwich. COOK, J. - Carte des Isles Sandwich. Carte des Isles Sandwich. - COOK, J. 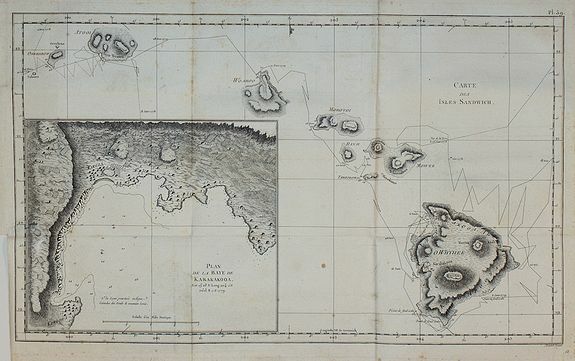 Title : Carte des Isles Sandwich..
Map maker : COOK, J.. Size : 10.6 x 17.9 inches. / 27.0 x 45.5 cm. Description :From the French edition of James Cook's third voyage entitled Troisième Voyage de Cook, ou Voyage à l'Océan Pacifique, ordonné par le Roi d'Angleterre, pour faire des découvertes dans l'Hémisphère Nord […] sur les Vaisseaux la Résolution & la Découverte, en 1776, 1777, 1778, 1779 & 1780. Engraved by Robert Benard. Published in Paris by Pancoucke in 4 volumes with numerous illustrations, charts, and maps. Captain James Cook, explorer, cartographer and hydrographer went to command several notable voyages, the first was from 1768-1771. He was led to his commission by the direction of British overseas exploration in 1766 as commander of HM Bark Endeavour for the first of three Pacific voyages. Cook's journals were published upon his return, and he became something of a hero among the scientific community. Cook's 12 years sailing around the Pacific Ocean contributed much to European knowledge of the area. Condition : A few brown stains on the lower part and some browning along the folds. A repaired tear on the left margin (1cm into the engraved area). Lower part of the left margin short.